it was the soporific effects of the turkey... the brandied fruitcake... the wine... the brandied mincemeat tarts and the shopping! This December was very busy with anticipated and unanticipated events. This large silly tree was created for the church party that was held at "Habit Coffee"; it was an anticipated event. 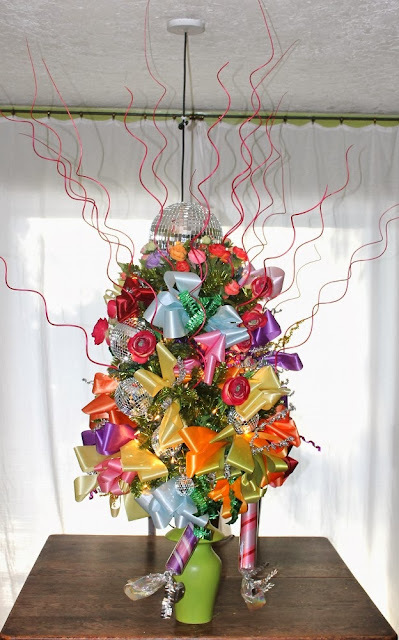 I wrapped a metallic lime green garland around a boxwood pyramid topiary tree, added mirror balls with a 10" mirror ball on top, ranunculus blossoms, wide bows in a myriad of colours, two candy canes at the bottom, and then wrapped two strands of mini lights around it for good measure. The spiral pink sticks were stuck in when it was finished for height and drama. Once the party was over it was put in our living room behind the TV. This was an unanticipated event that threw a monkey wrench into the proceedings. 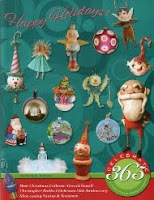 I wanted to photograph the decorations but was so busy shopping and baking that it kept getting put on the back burner. "I will photograph them just before Christmas," I thought. 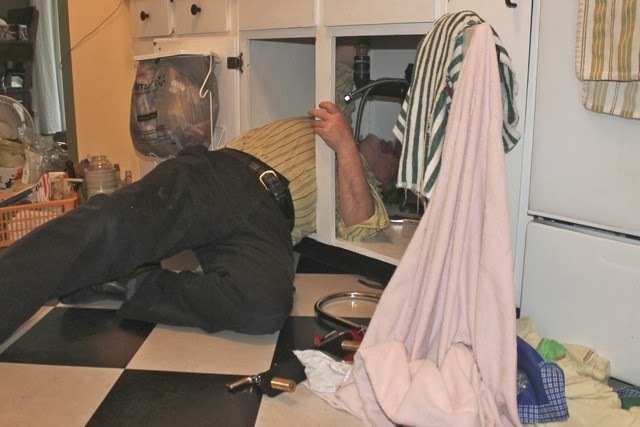 The Sunday before Christmas the faucet started leaking due to a crack created when Trish... well we won't go into that story but I still chuckle about it. Several hours of work went into emptying the contents from under the sink, undoing the faucets, drying out the water that had dripped down inside to get it ready for the next day. Monday started with early morning shopping at the plumbing store, home with our new kitchen faucet and then off to do more Christmas shopping. We arrived home in the early afternoon and I put the new faucet in place. I am not a plumber so I was slower than a professional. About a day was taken up with this little episode. Enough with the excuses already, here are the decoration pictures that I had promised to everyone on Facebook about three weeks ago! Click on the images for a look at a larger image. Coming into the living room from the hallway is like walking into an Aladdin's cave. There is the tree that I made for the church party, it's amazing to see that it is dwarfed by the rest of the decorations! 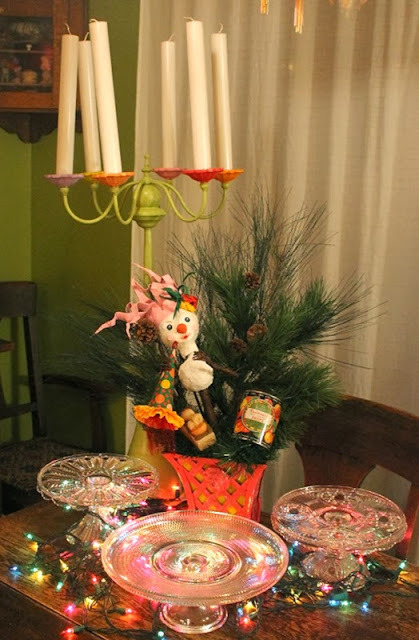 On December 14 our son and daughter-in-law had a party at our place. Many of their friends wanted to see the decorations, a lot of them we already knew and had been here years ago. I found out from my daughter-in-law that several of their friends refer to our house at Christmas as the Christmas cave. We had 35 to 40 people in our very small home, standing room only and it was a blast. The 6 foot feather tree is decorated with vintage Santa's, sleighs, cardboard houses and 1940's cellophane rope. Here is a closer look at the decorations on the tree. On the left side of the feather tree is my computer. 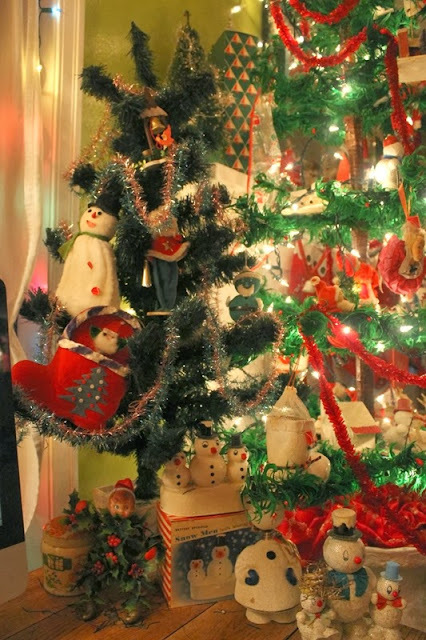 Tucked in the back is a 2 foot tree and a group of snowmen two of which are candy containers. The snowmen on the box are battery operated, their noses light up. 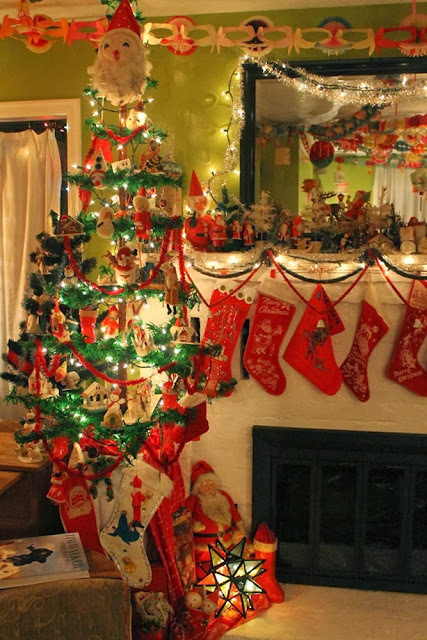 The mantle is hung with vintage Christmas stockings and decorated with Santas of various ages, from the Victorian era to the 1960's. A look at the right hand side of the mantle. Two of my boxed items, a candy tin and a bristle brush horseshoe with a candy cane. 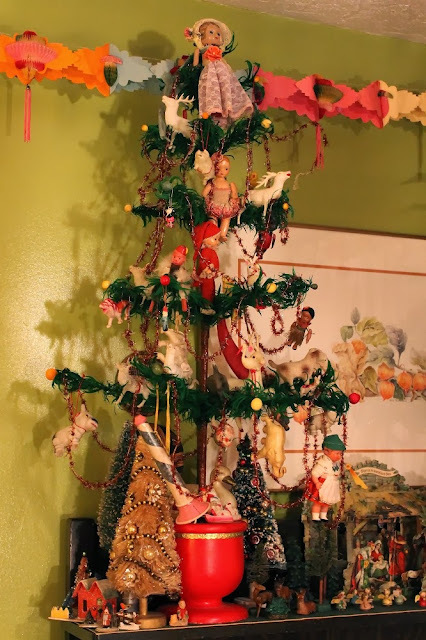 The 2 foot 1920's feather tree is decorated cotton batting fruit and doll, a wooden and composition dancing couple and topped off with a plastic angel. 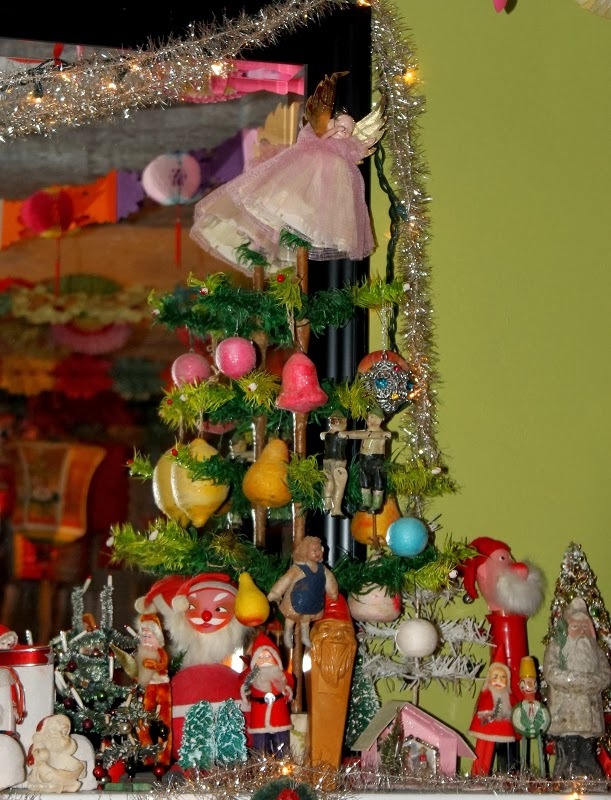 The buffet has a vintage cardboard house village with a bristle brush tree forest. 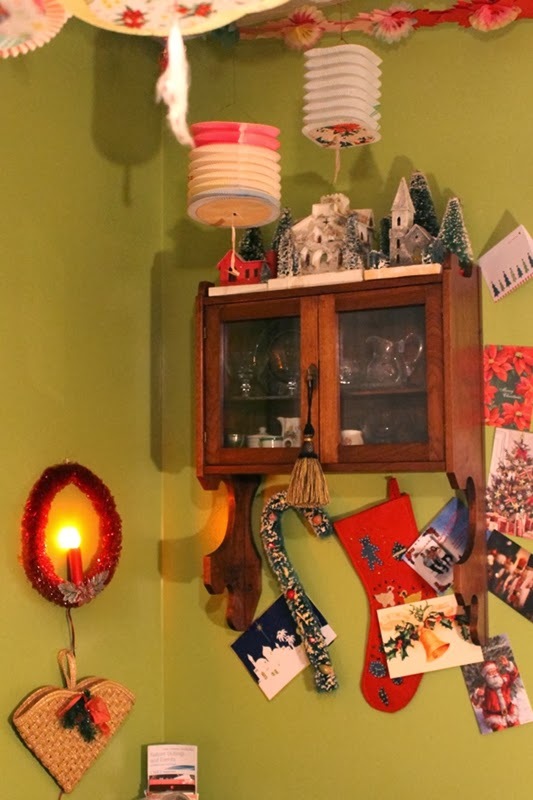 The top has an antique chromolithograph nativity that takes centre stage, although in the explosion of colour and quantity you may not believe it! After all, if it wasn't for Him there would be no Christmas. There are antique putz animals running and resting among the trees around the nativity. 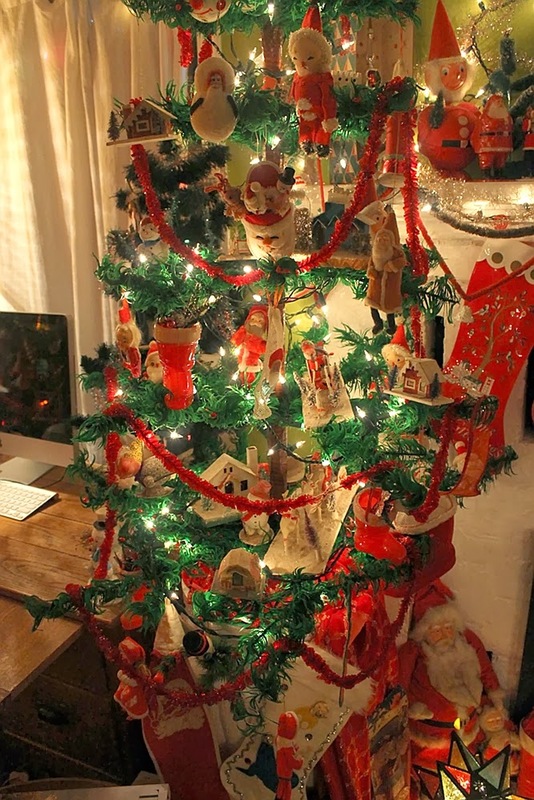 The three foot feather tree on the left is decorated with celluloid toys, decorations, and tape measures. It is draped with tinsel and cellophane roping. The tree on the right is decorated with cotton batting bells and birds draped with tinsel roping. 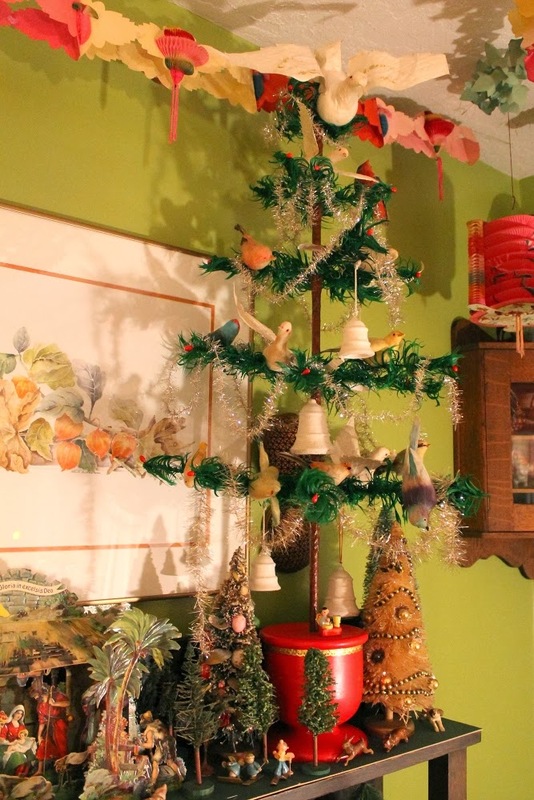 A large cotton batting and paper dove tops the tree. A wall cupboard has a mini village on top. A few of the candy and biscuit tins and packaged Christmas decorations. A large 1950's metal serving tray, pin back buttons, a small biscuit tin, cardboard tray and in the back you can just see some 1920's bristle tree place-card holders. 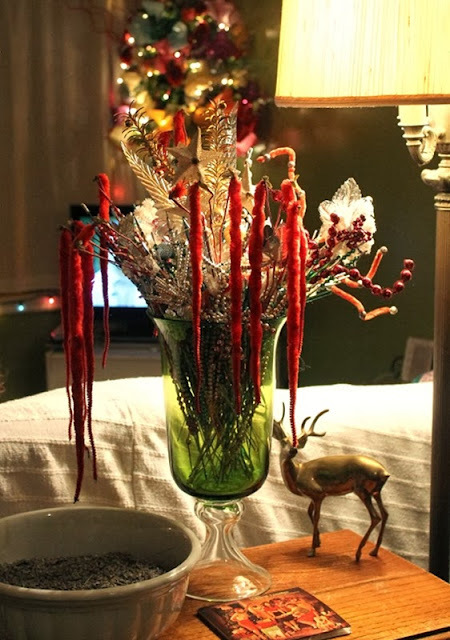 The large green glass vase is packed with glass bead spikes and other decorative spikes used in flower arrangements and decorating, all dating from the 20's to the 50's. My large snowman marotte is waiting for the food to be placed on the glass cake stands ready for the party to begin. The ceiling as usual is covered with paper garlands and vintage paper and silk lanterns, a nod to my British roots. I can't believe it, Christmas has come and gone and now for a lot of you so has New Year's Eve; am I ever late this year! But better late than never! To anyone that I missed wishing a Merry Christmas... MERRY CHRISTMAS!